To address this research gap, Dr. Dawes and colleagues performed a systematic review, which was published in JAMA, to examine the prevalence of mental health conditions in patients seeking and undergoing bariatric surgery. The analysis also evaluated two important connections between surgery and mental health. First, the researchers explored if preoperative mental health conditions were associated with differences in weight loss after surgery. Second, they examined if surgery was associated with changes in the clinical course of mental health conditions. 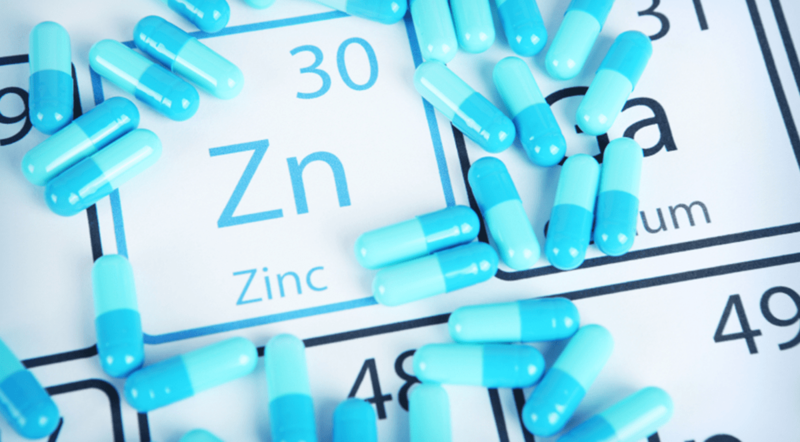 For the study, investigators searched trusted resources for studies published between January 1988 and November 2015 using terms like bariatric and obesity as well as the names of obesity surgery procedures, psychiatric disorders, and eating disorders. After screening nearly 2,300 articles, the authors identified 68 publications that met their inclusion criteria: 59 reported on the prevalence of preoperative mental health conditions (involving 65,363 patients) and 27 reported associations between preoperative mental health conditions and postoperative outcomes (involving 50,182 patients). According to the results, 23% of patients seeking and undergoing bariatric surgery had been diagnosed with a mood disorder. “Most clinicians might not be surprised that mood disorders were more common among this population, but it was surprising to find that nearly one in four patients carried a diagnosis at the time of evaluation for surgery,” Dr. Dawes says. The three most common individual mental health conditions in the study were depression, binge eating disorder, and anxiety (Table). The authors also found that 9% of patients seeking and undergoing bariatric surgery had previous thoughts of suicide whereas 3% had previous substance abuse disorders and 1% had PTSD. “Our estimates for depression and eating disorders were significantly higher than established rates for the general United States population,” says Dr. Dawes. “This suggests that special attention should be paid to these conditions when managing bariatric surgery patients.” In addition, clinicians should be vigilant about identifying other mental health conditions, such as psychosis, PTSD, and personality disorders. Although they appear to be less common, they may be more prominent in select subgroups, such as U.S. veterans. According to the study, the safety of patients with mental health conditions who undergo surgery appears to be complex. Higher rates of alcohol abuse were seen in patients who underwent some bariatric procedures—particularly among Roux-en-Y gastric bypass (RYGB) recipients—when compared with similar groups that were treated without surgery. This increase in alcohol consumption after RYGB may be due to physiological changes following intestinal bypass that are not present after other procedures, such as laparoscopic adjustable gastric banding. More research is needed to assess whether bariatric patients are at higher risk for suicide and alcohol abuse and to establish the most appropriate methods for postoperative monitoring in patients with a history of depression or substance abuse. National guidelines recommend routine preoperative health assessments, including a review of patients’ mental health conditions, but a more comprehensive, preoperative mental health exam may be necessary for those undergoing bariatric surgery. There are a variety of scales that focus on mental health diagnoses rather than psychosocial factors, and more studies are needed to further establish the roles of self-esteem, mental image, cognitive function, temperament, support networks, and socioeconomic stability. Dawes AJ, Maggard-Gibbons M, Maher AR, et al. 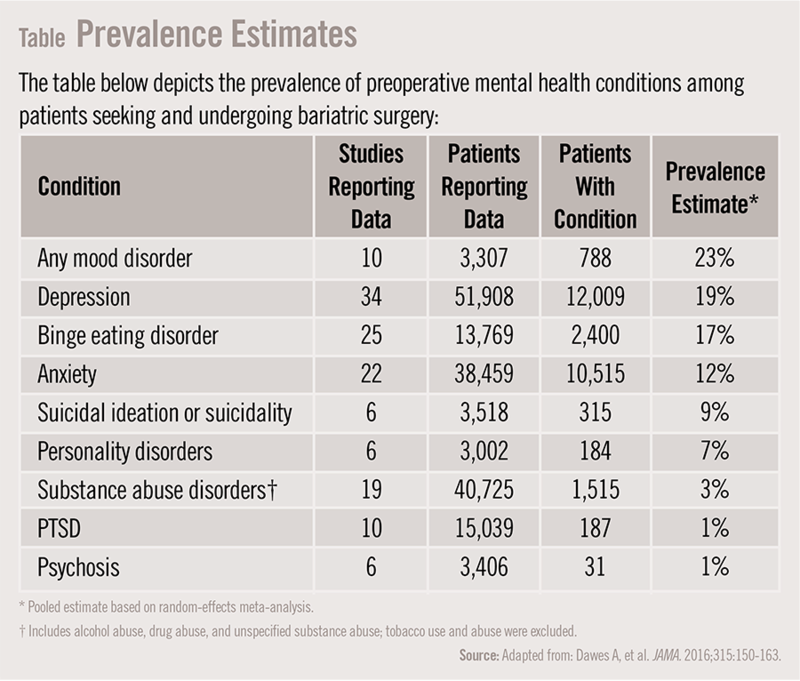 Mental health conditions among patients seeking and undergoing bariatric surgery. JAMA. 2016;315:150-163. Available at: http://jama.jamanetwork.com/article.aspx?articleid=2481004. Arterburn DE, Olsen MK, Smith VA, et al. Association between bariatric surgery and long-term survival. JAMA. 2015;313:62-70.
van Hout GC, Verschure SK, van Heck GL. Psychosocial predictors of success following bariatric surgery. Obes Surg. 2005;15:552-560. Livhits M, Mercado C, Yermilov I, et al. Preoperative predictors of weight loss following bariatric surgery: systematic review. Obes Surg. 2012;22:70-89. Aaron J. Dawes, MD, has indicated to Physician’s Weekly that he has received grants/research aid from the Department of Veterans Affairs, the VA/Robert Wood Johnson Foundation Clinical Scholars Program, and the UCLA Fielding School of Public Health.